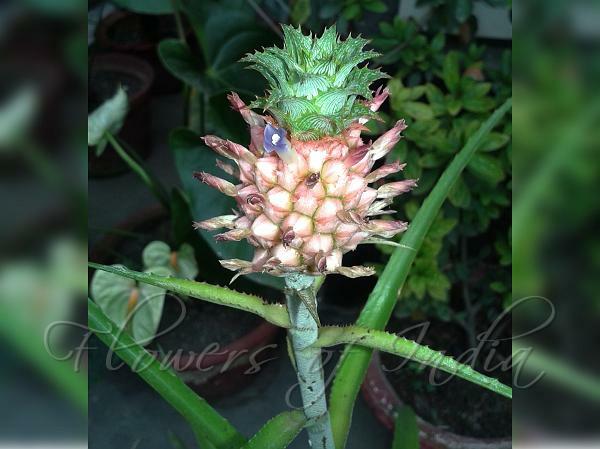 Dwarf Pineapple is a herbaceous plant with leaves forming a rosette. Leaves are sword-shaped, long and stiff, edged with sharp spines. The flower stalk emerges from the center of the plant, erect and long. Flowers are clustered on top of the stalk with several small leaves. Individual flowers are small and tubular, white with purple tips. The fruit is a collective fruit, formed from the fusion of individual fruits, pink in color, changing to pale yellow at maturity. 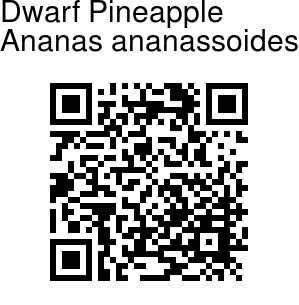 Dwarf Pineapple is native to a region of Latin America stretching from Costa Rica to Paraguay, cultivated as a garden plant. Identification credit: R.K. Nimai Photographed in Imphal, Manipur.